However, nothing like some time away to re-jig the system! DB and I had a micro-mini-break to Canberra to see the Incas exhibition at the NGA. It's finished now - sorry if I've inspired anyone to up tracks and head off to see it...but, it was fabulous. We have a well-practiced routine for Canberra now (which is, incidentally, helping me feel more fondness for the place - slowly getting me past the antipathy engendered by an 18 month residence there when Twenty-Eight was a wee small thing): stay somewhere within walking distance to our favourite eatery (Cream), pre-buy NGA exhibition tickets and be at the doors before 10 because once they fill up it's hard to get good viewing space, park over at the National Portrait Gallery (currently free, and even when/if they start charging, a MUCH easier carpark to get in and out of), eat lunch at the NPG (MUCH better menu and space), visit the NPG bookshop, which is awesome and the reason for this post! I don't know if there is a sub genre of knitting based writing - but I have noticed that books with knitting themes are increasing - perhaps as knitting re-establishes itself even more as a cool pastime for young and old. I have a group of fellow knitter friends, known as the Knotters Club, a title that happened as a result of a typo in some Facebook chat with one of the others. She followed it up with a spot of research and discovered that in Japan, ALL yarn/thread related crafts are known as 'knotting' - which tickled both of us, and reminded me of a dear friend long ago, who famously said - as she laboured patiently with the lace yoke of a sweater - that knitting was "just one big knot". Ann Hood, from the blurb on the back flyleaf, is a fiction, travel, food and spiritual writer. There's a tempting list of other books - one with knitting in the title - that, obviously, I'll have to hunt down. She also knits. In her introduction, she explores the genesis of her own knitting, and that of others she's talked with since picking it up in 2002 - post the death of her young daughter, when she couldn't read or write - and also, why it is that knitting figures so much in writing. She put out a call to writers for essays on knitting, and was inundated. A selection of those essays were put together to make this book, interspersed with patterns - alas, no accompanying images... The contributors include Barbara Kingsolver, Ann Patchett and Anita Shreve - just a few of the more well-known writers. There are also a few male writers (we have one in The Knotters, and potentially a second, if our get-togethers ever coincide with his availability, given he has a long drive to get to us). The essays range from memory tales of relatives who taught the writers to knit, to relationships formed and links to departed family members maintained through knitting, stories of knitting failures and disasters, and one that mentions the great relationship knitting jinx - knitters will know about that one, any non-knitters out there will have to get their hands on a copy of the book to read about it! I like anthologies like this. I like being able to pick them up and put them down - the essays are all short to medium chapter length. I like all the different voices. And I really like finding common ground with so many different writers. 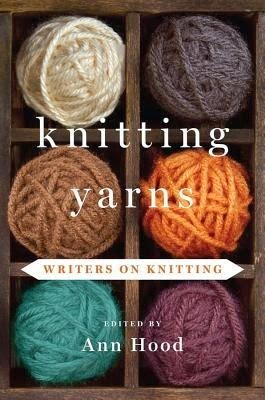 Even if you're not a knitter, this book has some lovely writing to explore, so if you come across a copy, have a dip into it, and if you have a knitting friend, it's an excellent gift idea.